This figure shows the molecular structures of ice XI and ice Ih and plots their existence in the solar system as a function of temperature and distance from the sun. Blue circles correspond to oxygen atoms and red circles are protons (i.e. hydrogen atoms). The area below the red line (which corresponds to a temperature of 72K) is where ice XI exists as a stable form in the solar system. E, M, J, S, U, N, and P indicate Earth, Mars, Jupiter, Saturn, Uranus, Neptune, and Pluto, respectively. Various forms of ice have been found in many locations within the frigid reaches of our galaxy, from interstellar clouds to comets, moons, and planets. But a particularly intriguing and rare type, “ferroelectric” ice – ice crystallized so perfectly that it can sustain a giant electric field – has never been detected by astronomers. A recent study, however, has produced evidence that ferroelectric ice, also known as ice XI, likely does exist out there. Performed by a team of scientists from the U.S. and Japan, the study revealed a very narrow range of temperatures in which “normal” ice can transform into ice XI in nature. The research was led by Hiroshi Fukazawa, a scientist at the Japan Atomic Energy Agency. Normal ice, which forms all natural snow and ice on Earth, is known to scientists as “ice Ih,” where the 'h' stands for hexagonal, the shape of the molecular crystal. In ice Ih, the bonds between the hydrogen and oxygen atoms are oriented randomly, resulting in a crystal that looks fairly messy. At very low temperatures, however, the bonds begin to line up and point in the same direction; high pressure enhances this ordering effect. As a result, the tiny electric fields naturally carried by each water molecule add up to produce one large field. The group wanted to learn more about the conditions required for the formation of ferroelectric ice. 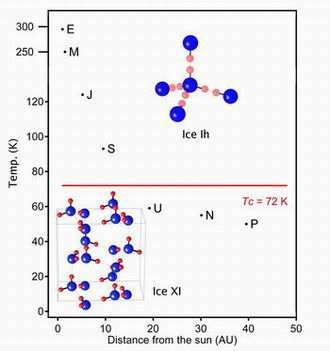 They created a sample of ice that contained a carefully measured amount of an impurity compound, which alters the crystal slightly and thus assists the ice XI conversion process. At ORNL's High Flux Isotope Reactor, the ice was cooled gradually as it was bombarded with neutrons. In this technique, called neutron diffraction, neutrons enter a sample, scatter away from its atoms and, when they exit the sample, are recorded by a detector as a scattering pattern. Analyzing the pattern reveals valuable information about the arrangement of atoms in the sample. Using this method the group “saw” that ice XI formed over the course of several hundred hours, and its structure remained stable in the narrow temperature range of 57-66K. “This is the temperature range at the surfaces of the outer planetary bodies in the solar system – Uranus, Neptune, and Pluto, their satellites and rings, as well as the rings and some moons of Saturn, ” said Fernandez-Baca.